Club Skirts is thrilled to present some of the hottest lesbian YouTube celebrities at this year’s Dinah Shore Weekend in Palm Springs, CA. Held during the Sunday Pool Party at the Hilton Hotel, the special meet and greet will start at 2:00pm and feature YouTube sensations: Ally Hills, Ambers Closet, ElloSteph, Life of Bly, Ari Fitz, Arielle Scarcella, BriaandChrissy, and Cammie & Shannon. The event highlights popular YouTube channels run and hosted by lesbians who share their experiences in their daily lives with humor and honesty. 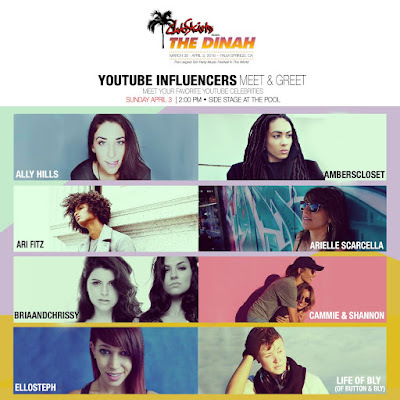 For the first time ever, some of our community’s most beloved YouTube influencers (lesbian vloggers) will gather together all under one roof during one massive Pool party - an exclusive premiere happening only at The Dinah!